﻿Opel will celebrate 120 years of car manufacturing in 2019 and thus 120 years of German engineering and innovative technologies, which the carmaker makes available to a broad range of customers – true to the Opel motto ‘The Future is Everyone’s’. To celebrate this special anniversary, Opel is launching the ‘120 Years’ special editions. Passenger car models such as the current Corsa, the bestselling Astra, the Crossland X, the Mokka X and the Grandland X right up to the Insignia flagship will be available in the ‘120 Years’ trim, featuring a wide range state-of-the-art technologies, design and comfort features as standard. Order books for the Corsa, Astra and Insignia ‘120 Years’ edition models are open now, while the Crossland X, Mokka X and Grandland X order books will open in December. The special edition trim sits directly above the SC trim in most models and, depending on the model, includes assistance systems such as Park Assist or Cruise Control as standard. Features such as heated seats, heated steering wheel and velour floor mats increase the level of comfort. The ‘120 Years’ models become true eye catchers with stylish alloy wheels, chrome elements, door sills with Opel lettering and of course the ‘120 Years’ badge. And all this is available at attractive prices. For example, the special edition Corsa is already available from €16,650, while the 120 Years anniversary Astra starts at €23,895. Looking at the Astra in greater detail - the compact Opel bestseller already shines with assistance systems such as Hill Start Assist, Air Conditioning and Cruise Control as standard in its entry-level version. Fog lamps and Rear Park Assist are added as standard on the ‘120 Years’ variant. Heated front seats and the heated steering wheel along with the sight package including rain sensor, automatic headlamps with tunnel detection and automatic dimming rear-view mirror ensure comfortable temperatures and an increased level of safety on cold and wet days. In addition, Astra 5-door and Sports Tourer drivers and occupants can rely on outstanding connectivity and entertainment thanks to the Apple CarPlay and Android Auto compatible R 4.0 IntelliLink infotainment system with seven-inch colour display. 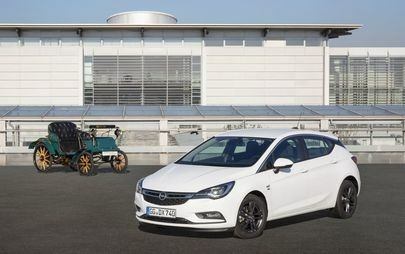 The door sills with Opel lettering, 17-inch alloys in 5-twin-spoke design and the ‘120 Years’ logo immediately identify the Astra as a special edition model.